" Bonjour Madame, je vais prendre quatre croissants et deux chocolatines, s'il vous plaît". 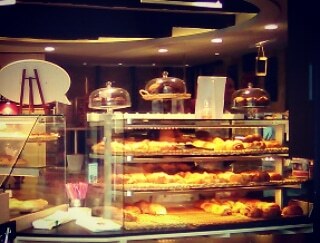 We use this term "viennoiseries" as it refers to where the recipes come from: Vienna, Austria. The first bakery with "viennoiseries" was opened in Paris in 1837 by two Austrian men, August Zang and Ernest Schwarzer, and was situated at 92, Rue de Richelieu, Paris. At the beginning of the 20th century the viennoiseries like the croissant became a symbol of France.